GAWLER Harness Racing Club is back racing at its own track. ECSTATIC: (from left) Karen McColl (Liberal candidate for Light), GHRC president Peter Bain, HRSA chairman Chris Hartwig and member for Light Tony Piccolo. The new venue, on Two Wells Road, received the tick of approval with a soft opening last Sunday. A crowd of about 1200 turned out to watch a six-event program. It was the club’s first meeting on its own track since Friday, June 6, 2008 when their complex on Weaver Road was forced to shut down for the building of the Northern Expressway. Gawler President Peter Bain said it was a proud moment for current and past committee members to be back racing at their own track. 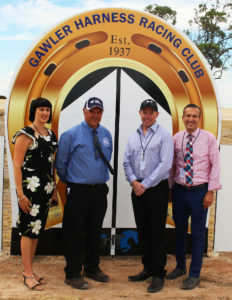 “Thanks to Harness Racing South Australia, the Light Council and our local member Tony Piccolo, who have all contributed to bring about harness racing again being staged in Gawler,” Bain said. “Everything went off really well and we look forward to a debrief to work out when the club can hold another meeting. Chairman of Harness Racing South Australia, Chris Hartwig, said it had been a ‘feelgood’ Sunday. “Considering we did not push the meeting to allow for a soft opening, I thought it was a good crowd and there were a lot of people I had not seen previously at a harness meeting,” Hartwig said. Chief steward of Harness Racing South Australia Ross Neal, said it been a successful opening meeting. “There will need to be more permanent things put in place to race regularly at the venue, but the good thing was that the club was able to race again, and they have built an excellent track,” Neal said. The member for Light, Tony Piccolo, said it was great to have harness racing return to Gawler. “It was a wonderful day, with a family feel, and I thank all the volunteers who made it happen,” Piccolo said.